The other day, my Koi asked me a difficult question. "How come all the other pets have so much higher resolution than me?" he said, his Pantone 292 dorsal fin drooping in a frown. "I feel so blue." Stumped, I didn't know how to answer him. The truth is I hadn't thought about the origin of my fuzzy little Koi, let alone his spectre-like swamp gas sister (that's a story for another day). The little Koi and I had found each other in the Pound, both pre-formed and accepting of each other's unknown stories. But I knew that the day would eventually come when my young pet would wish, from a sense of curiosity and desire for belonging, to know the nature of their history. And so the journey begins. First stop: Mystery Island. As we depart the wharf, we bypass Tiki Tours to canvas the wares of the Trading Post. We consult traders from dealers of rare paint brushes to hawkers of basic colours, but soon discover there is no 8-Bit brush to be found (which in a way makes sense - how do you apply paint to data blocks?). We go to play Mynci Beach Volleyball, and one of the Pawkeets attempts to nibble at Beans. "Don't do that!" I say, but he doesn't seem to mind. Next we pay a visit to the Fountain Faerie. I've heard rumors that a Flask of Rainbow Fountain Water, with luck, can transform a pet to become 8-bit. I roll up my jeans as I wade through her effulgent fountains, squinting as water arcs into the sky and throws rainbows on the horizon. But the Fountain Faerie merely shakes her head as my poor little Koi splashes about her watery palace, glimmering with tiny flashing squares of white and grey. He is generally ignored by his more aesthetically-defined peers, but a cheery young Flotsam greets Beans with a high-five and they race off to play underwater tag with the Jetsams. We leave with a new friend and more questions than answers, but stopping for a conciliatory smoothie I find out the 8-Bit mystery is much closer to home. In the heart of Neopia Central, the surest way to render a Neopet to its most frugal configuration is to obtain an 8-Bit Powerup Potion. (It's either that, or risk your pet to the mad scientist - I know I'd rather give my pet the mysterious potion any day.) This rare concoction has a trading price tag of over one million Neopoints according to market sources, but the potion can be purchased for just a fraction of this at Kauvara's Magic Shop in Neopia Central. I decide to pay a visit to Kauvara to enquire who her suppliers are, and to perhaps find out how this transformative brew came to be. I'm a little disappointed as Kauvara tells me, despite constant replenishment of stocks, no 8-Bit Powerups have graced the shelves since the last restock. Brushing the dust from an old order, she tells me the 8-Bit potion production commenced in 2012, six years ago - long before my pet began to struggle with his body image. "It's a phase all teenagers go through," Kauvara tells me. "But Beans is only seven years old!" I protest. The Kau shrugs, passing me an Elixir of Happiness. "Everyone's different. I wanted to be a magician when I was your age, but now I'm a shopkeeper. That doesn't mean I'm not a magician as well. Have you heard of Kauvara's Potion?" It's true; we are all diverse. Difference is uniqueness. I tell this to Beans every day, and try to affirm his positive body image by saying things like "Wow, your integers are really dimensional today!" and "Dang, have you lost pixels?" I try to fill the Neohome with circa-1990s proto graphics to boost his self esteem, and show him that there are plenty of other pets who are 8-bit and living their best lives. But until the cultural structures and expectations around data configuration change, these hollow compliments inevitably make him glummer. 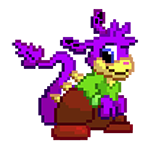 Currently, 30 different Neopets can be 8-Bit: the colour comprises Acaras, Aishas, Bruces, Chias, Chombies, Cybunnies, Draiks, Elephantes, Flotsams, Grundos, Hissis, Jubjubs, Kois, Korbats, Kougras, Lennies, Lupes, Meercas, Moehogs, Nimmos, Poogles, Pteris, Quiggles, Rukis, Scorchios, Shoyrus, Techos, Unis, Wockies, and Zafaras. But despite this, common misconceptions about 8-Bit pets include that they don't need food, clothes or levels of care that have always been required for pets. This lack of understanding can sometimes make it difficult for 8-bit Neopians to feel like they belong. For instance, in the NC mall there are no clothes that will fit Beans except for a single pair of pants. Usul assistants swan past him as he pouts in the mirror, holding up a block of pixelated denim. "Fish don't wear pants," he insists, opting for an 8-bit mossy rock to furnish his aquatic ecosystem (he tells me he'd rather go pantless than risk the nickname "Beans in Jeans"). From the bazaars of Neopian Central to the tide pools of Maraqua, he is so often mistaken for a programming glitch that many pets attempt to walk straight through him, before finding that he's solid. At the Ye Olde Fishing Vortex, he is usually taken for a Waterfish and ignored. On the other hand, when visiting the Games Room the other pets blink quizzically, wondering if the characters in the arcades have come to life. The owners drag their pets away rubbing their eyes, and insist "that's enough gaming for today", shaking their heads as they bemoan "another gimmick which should have been left in the sandbox." But whether or not this is true, I'm sure you'll agree it's beside the point: 8-Bit pets are here, and they're here to stay. The reality is, while 8-Bit pets are conceptually pre-digital, they are no less real than any other virtual pet. They too have complex desires, dreams and fears, and they need to be clothed, fed and played with. Whether my own pet Beans was zapped by the notorious Lab Ray, fed a Kaleideonegg, or transformed by a potion, his experience is just as valid and important as any other. All low-pixel pets like Beans should be enabled to participate fully in this great land we call Neopia. When it comes down to it, we are all pixels - some just happen to be more defined than others.